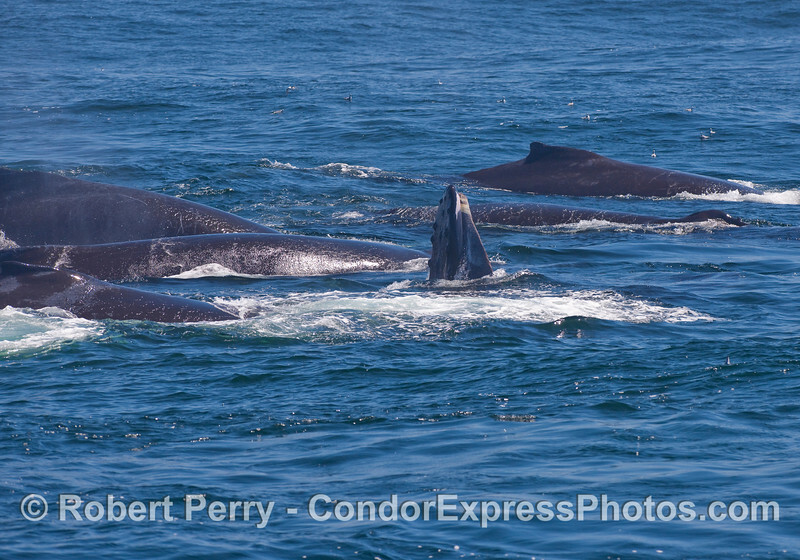 Masses of Humpback Whales (Megaptera novaeangliae) and Blue Whales (Balaenoptera musculus) lunge feeding on the surface. One of the 7 wonders of the natural world. Far, far to the west. Don't forget you can see where all the photos were taken on a map by clicking the "Map This" feature on the upper right side. 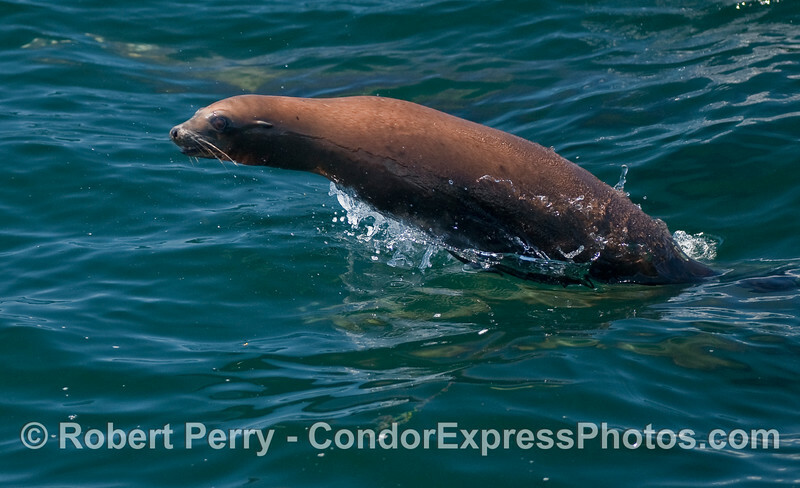 A leaping California Sea Lion (Zalophus californianus). 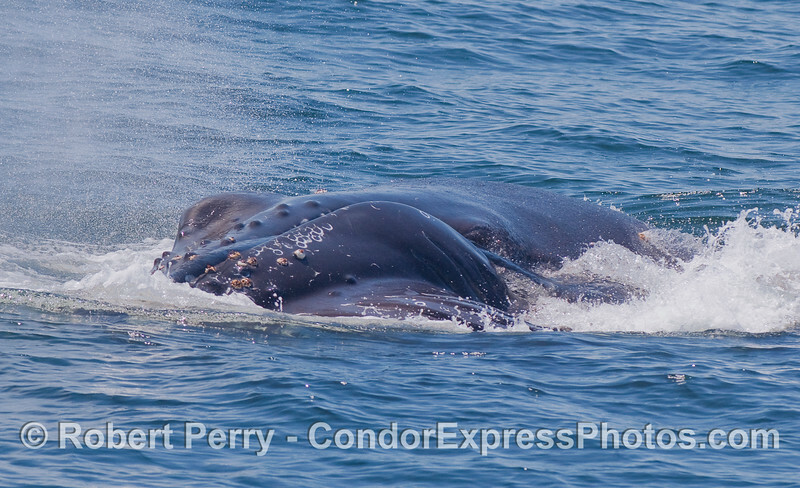 Extremely close look at the back and blowholes of a Humpback Whale, post spout. 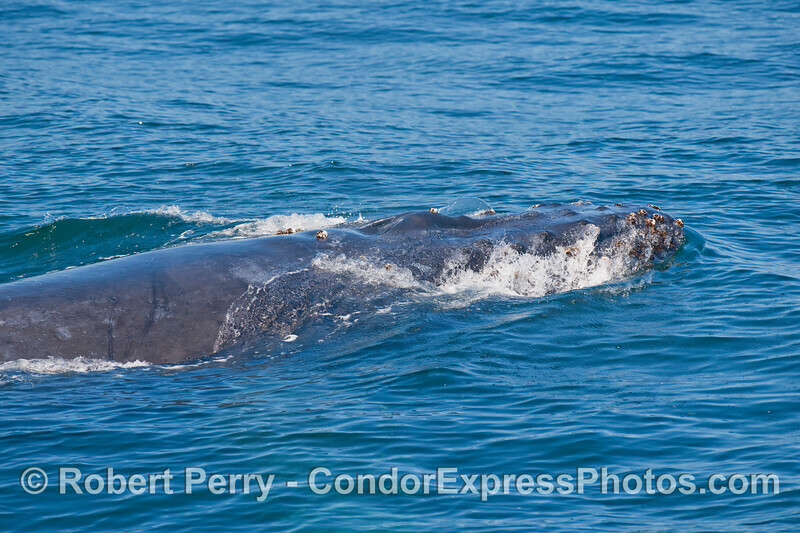 A giant Blue Whale in the act of feeding. 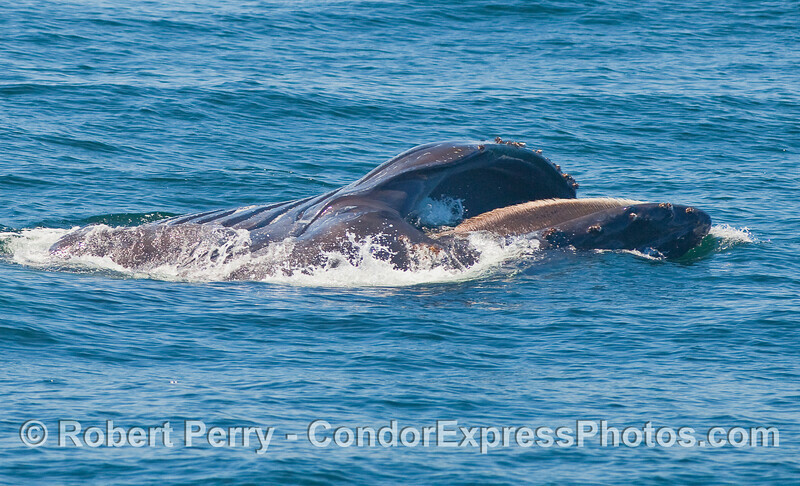 The beast is laying on its left side with its right pectoral fin and right tail fluke held vertically. The expanded ventral grooves can be seen to the right. 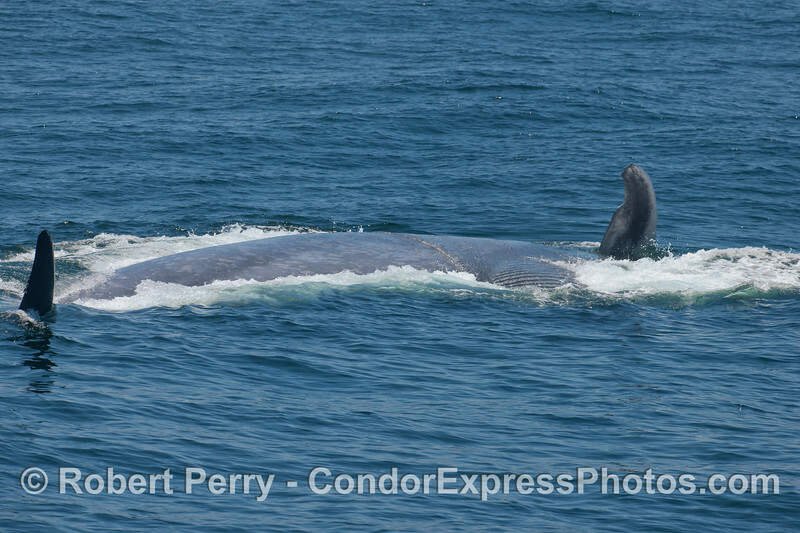 Whalers on board the Condor Express get a great look at a giant Blue Whale. 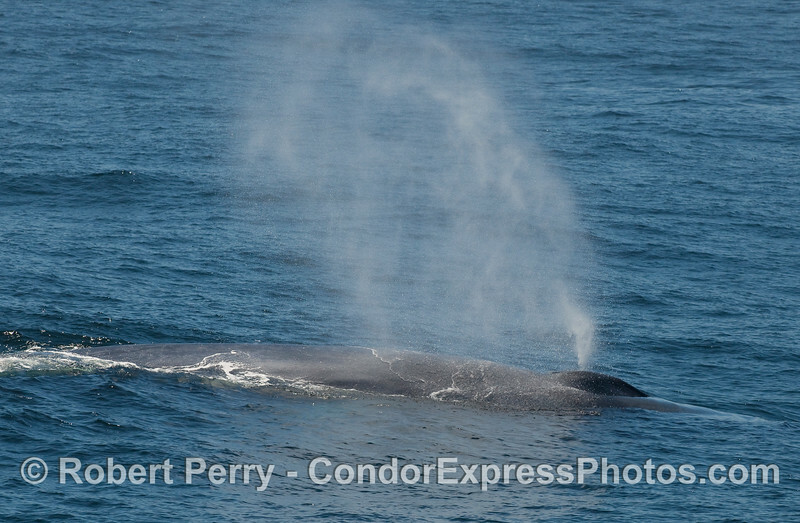 A Blue Whale passes very close to the Condor Express and sends up a tall plume of spray. 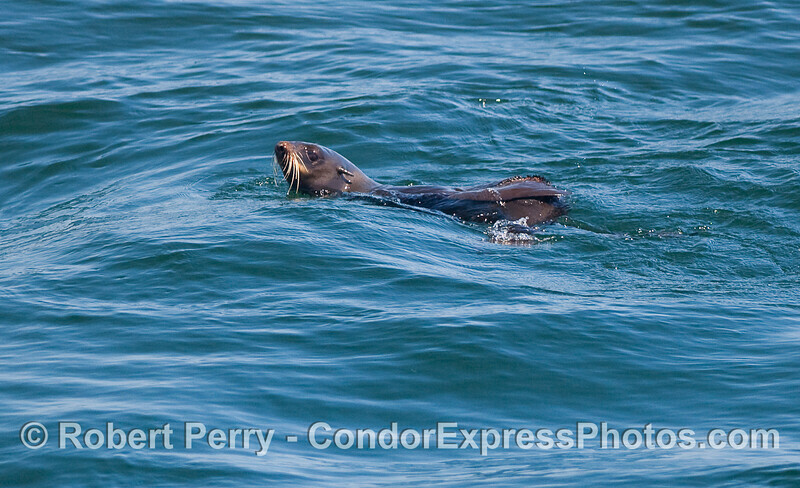 A Northern Fur Seal (Callorhinus ursinus) is intrigued by all the whale activity. 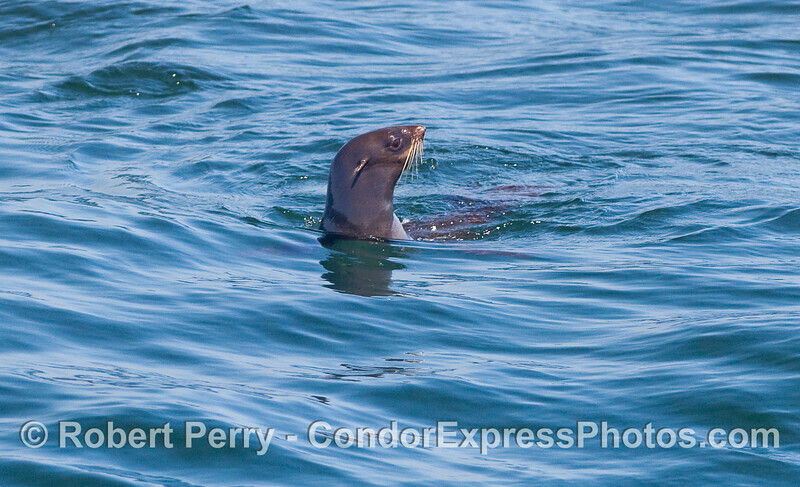 Looking at the camera - Northern Fur Seal (Callorhinus ursinus). A nice profile of the head of a Northern Fur Seal (Callorhinus ursinus). 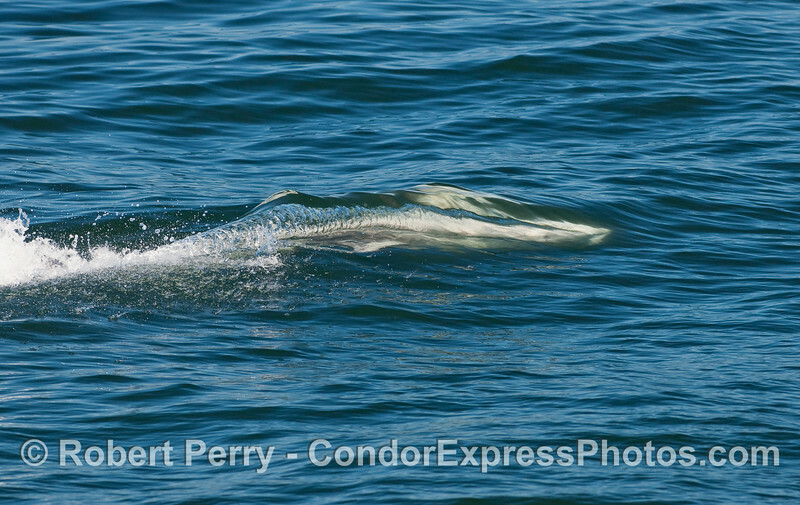 A big Risso's Dolphin (Grampus griseus). 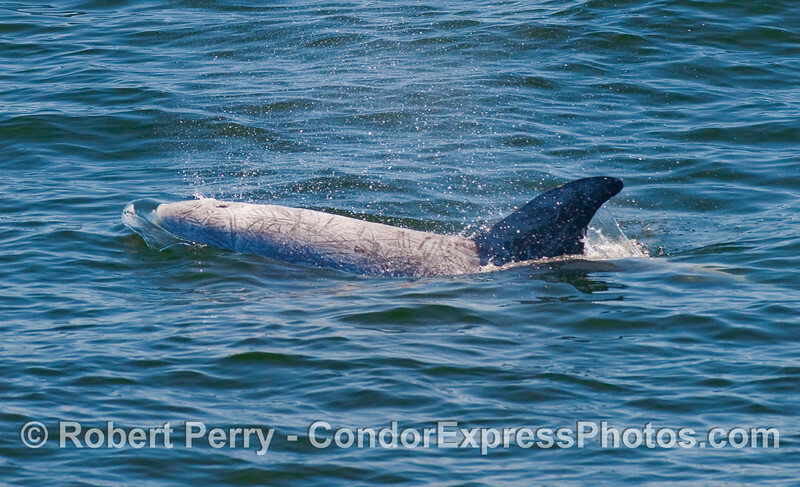 A high speed torpedo - Risso's Dolphin (Grampus griseus) underwater acceleration. 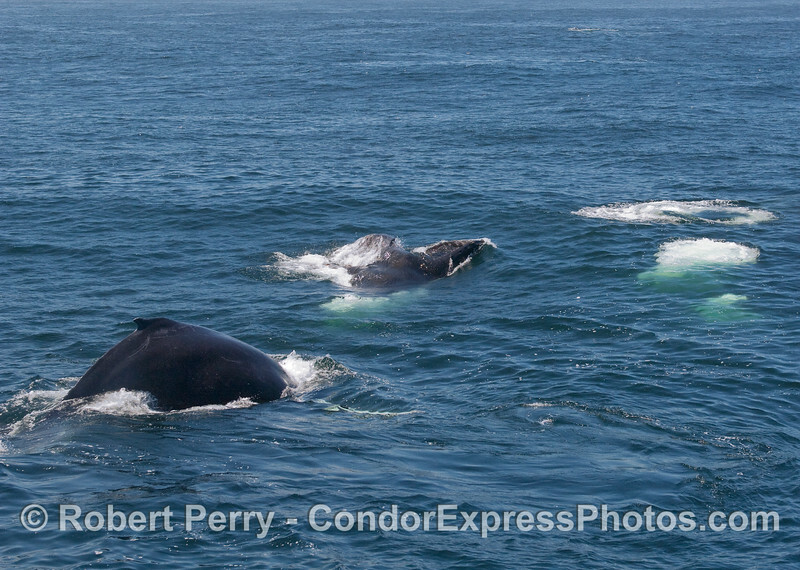 Two Humpback Whales put on a show for the whalers on the Condor Express. 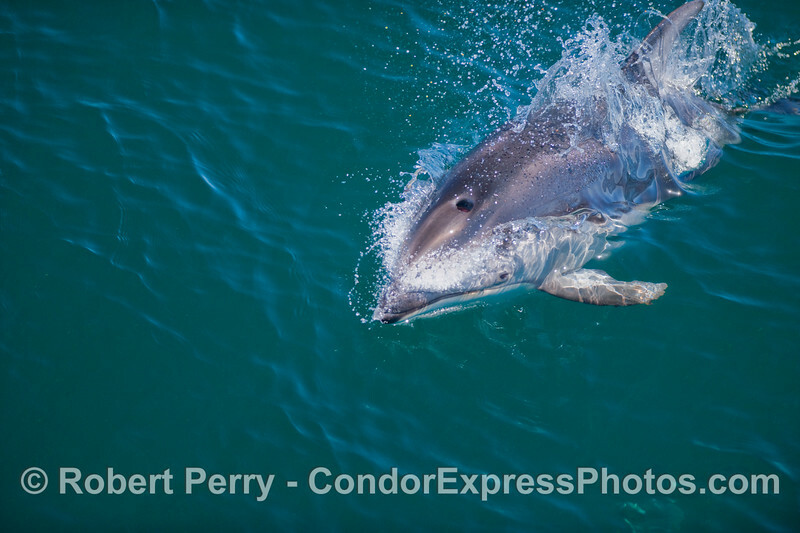 A very close up view of a Pacific White sided Dolphin (Lagenorhynchus obliquidens). 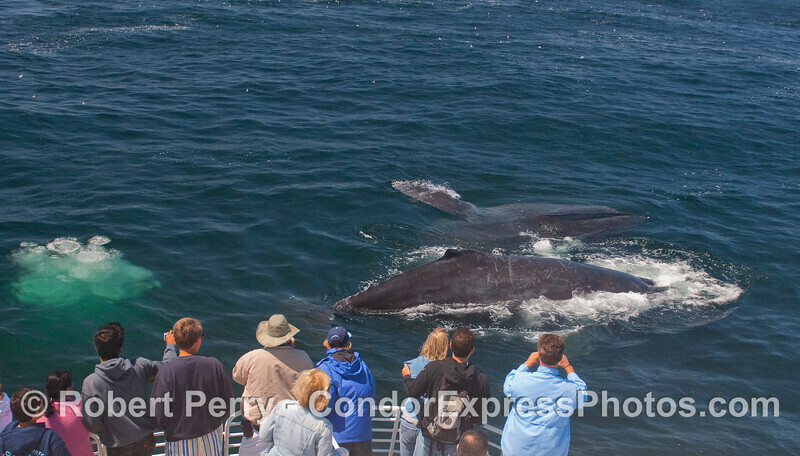 Two more Humpback Whales very close to the boat. 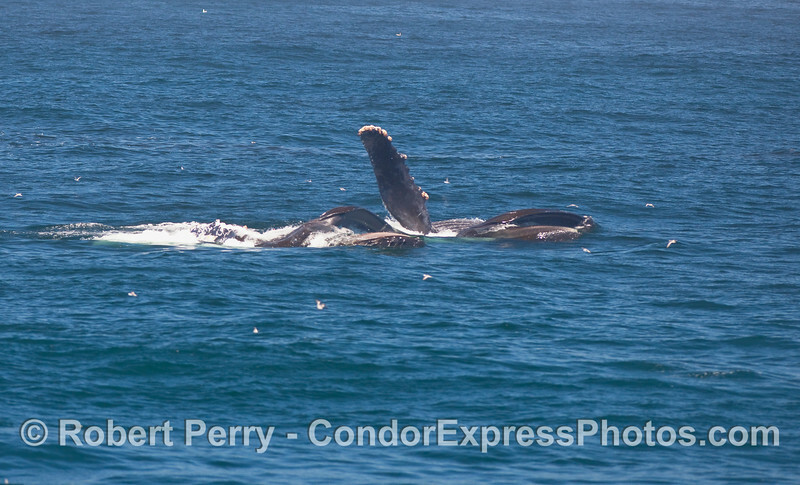 Two surface lunge feeding Humpback Whales, side by side. 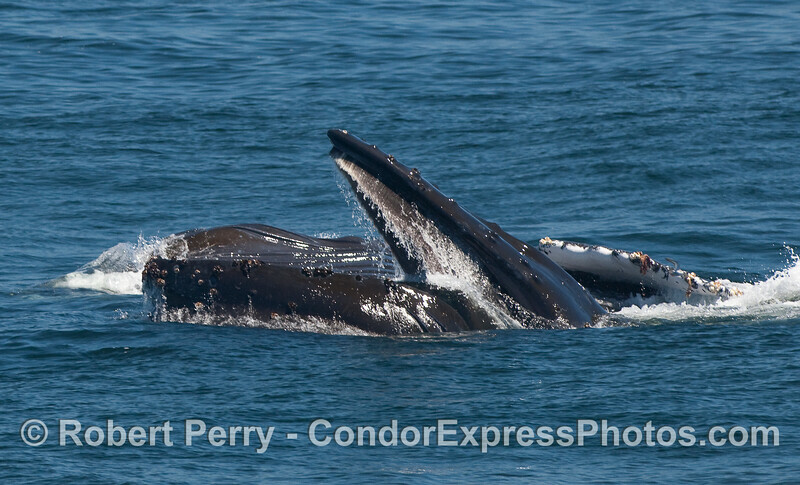 Two feeding Humpback Whales, one lunges upward vertically, and the other has its mouth wide open sideways underwater. Tiny red dots of Krill (Thysanoessa spinifera) can be seen in the water spilling out of the upper whale's mouth. 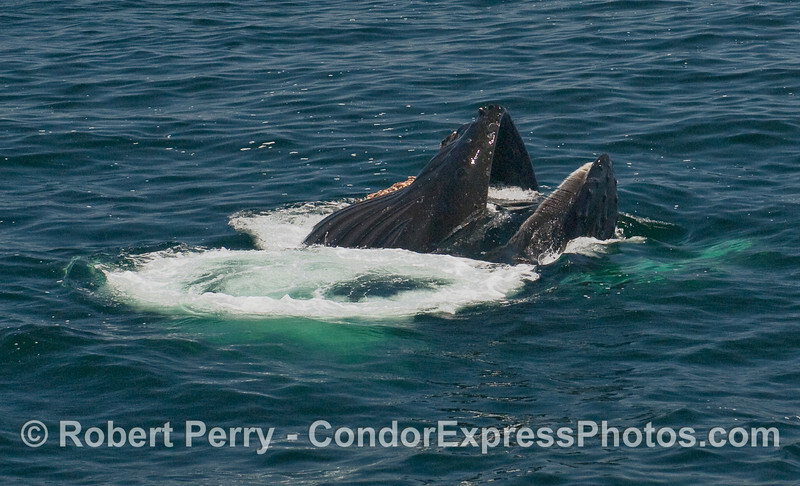 Two feeding Humpback Whales. The left whale, seen spouting, has a large volume of water being squeezed out of its mouth during the terminal stage of feeding. 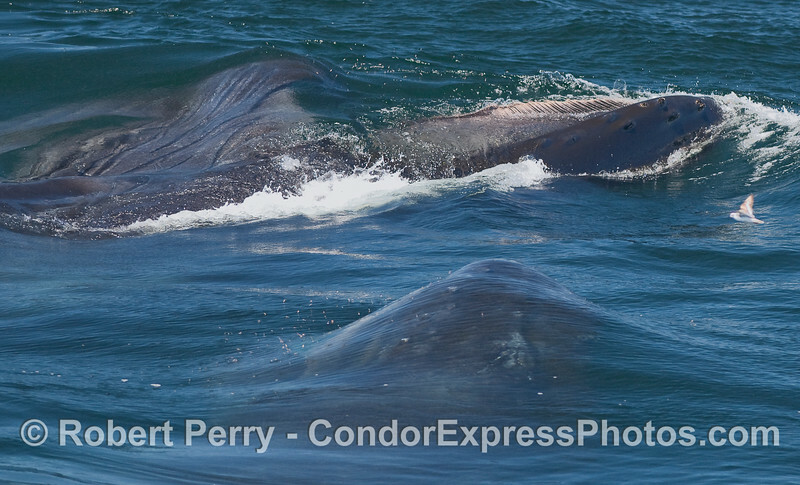 The whale on the right is in the act of lunging vertically and the baleen in the upper jaw can be seen clearly. Extreme close up view of two feeding Humpback Whales. 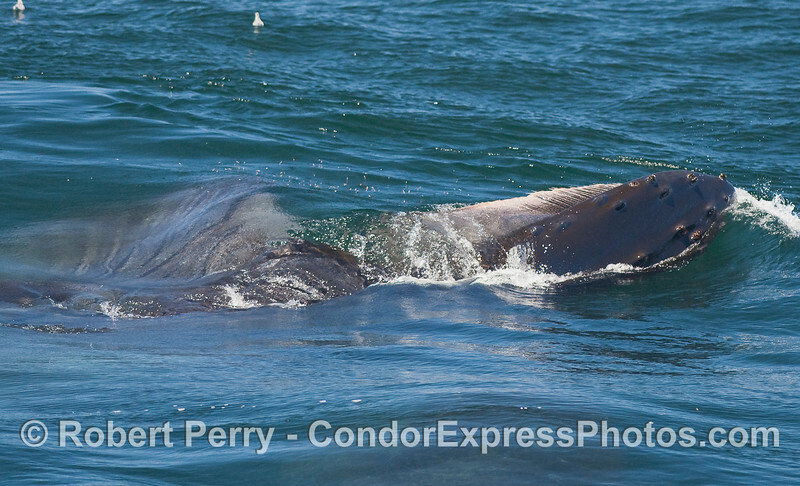 The upper whale is lunging sideways and its mouth is wide open with the baleen showing. 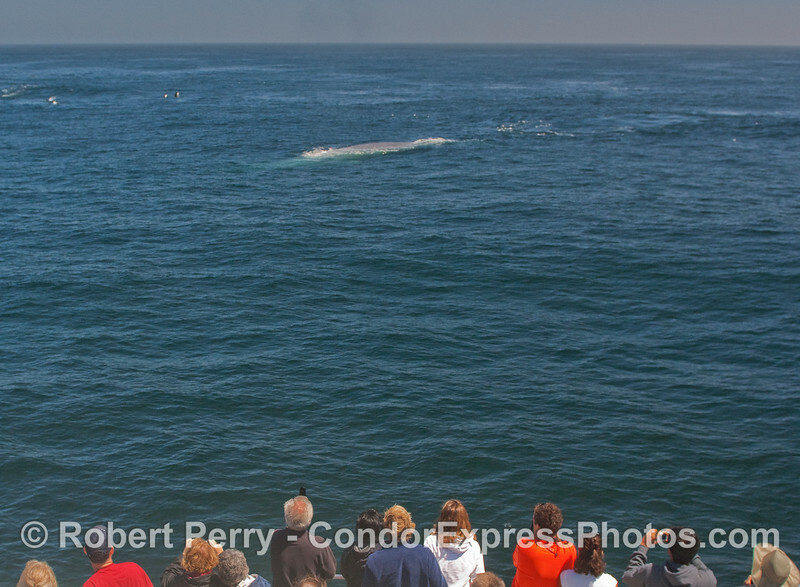 The lower whale is still just under the water but quickly rising toward the surface. 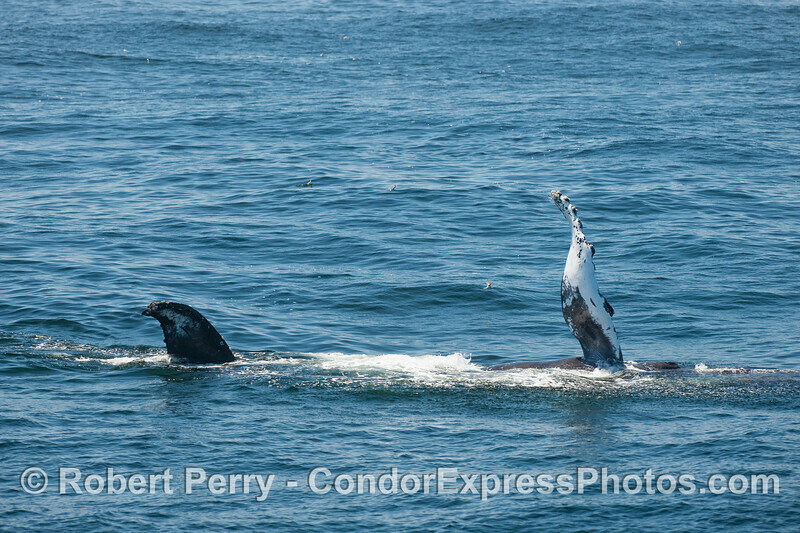 Krill can be seen jumping out of the water to the left side of the lower whale. 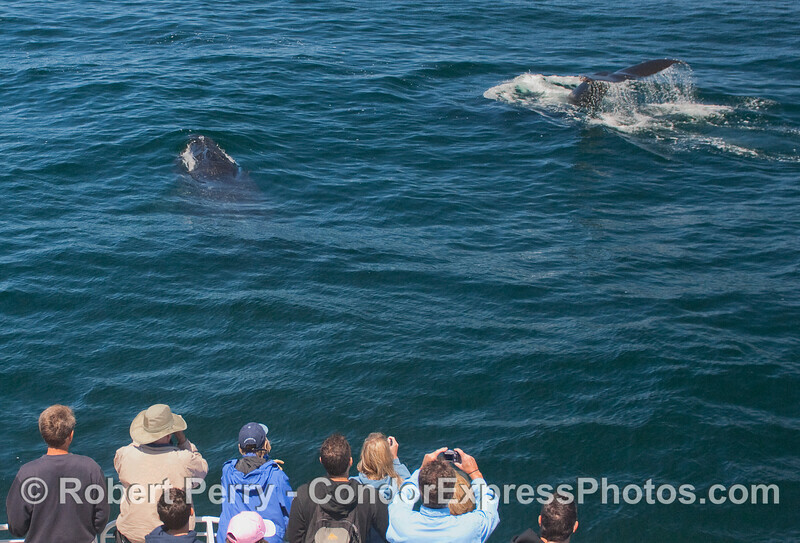 A head-on perspective of two feeding Humpback Whales. 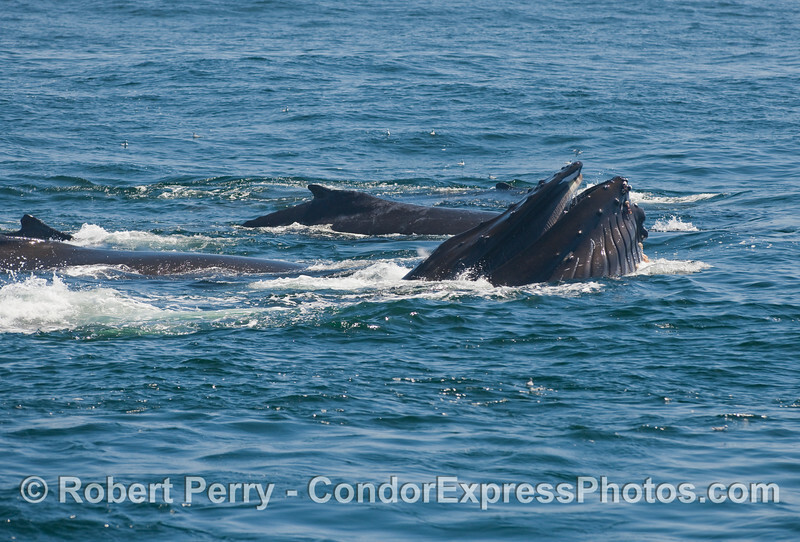 Three feeding Humpback Whales, all upside down and heading from left to right. 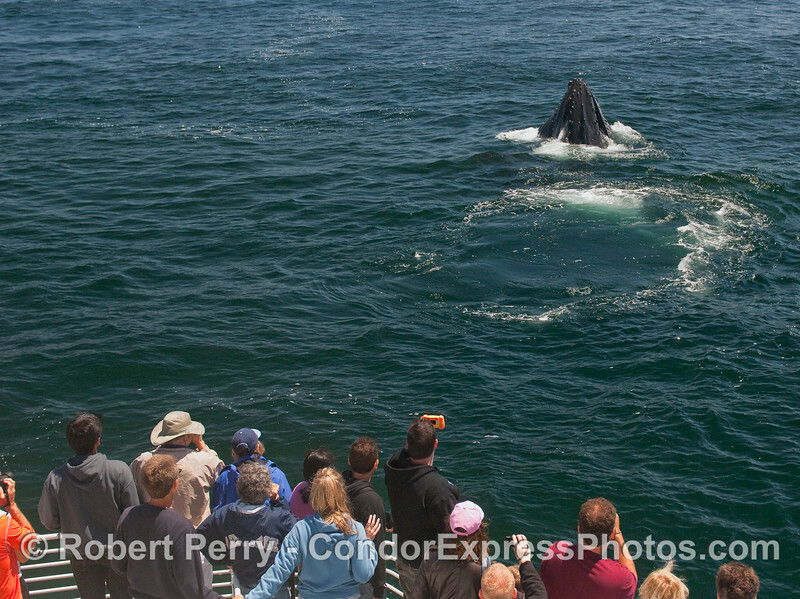 A friendly Humpback Whale surfaces close to the camera lens. 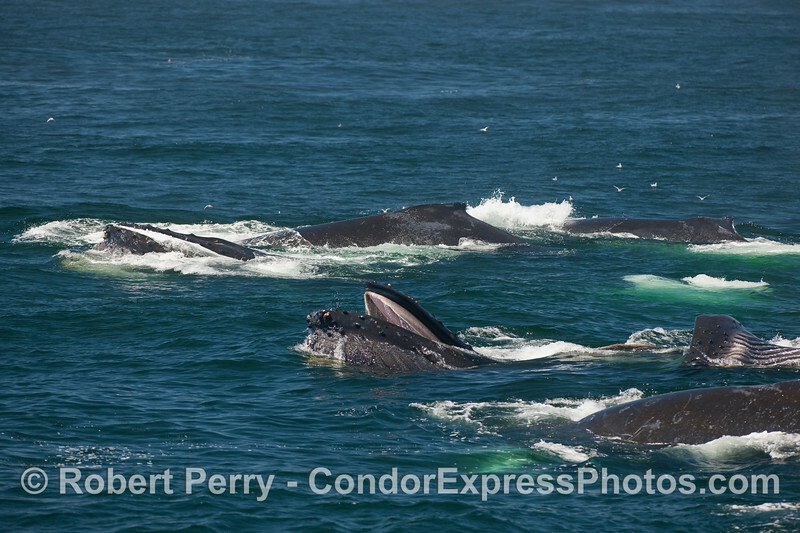 Four Humpback Whales, one is captured in the midst of a vertical lunge. 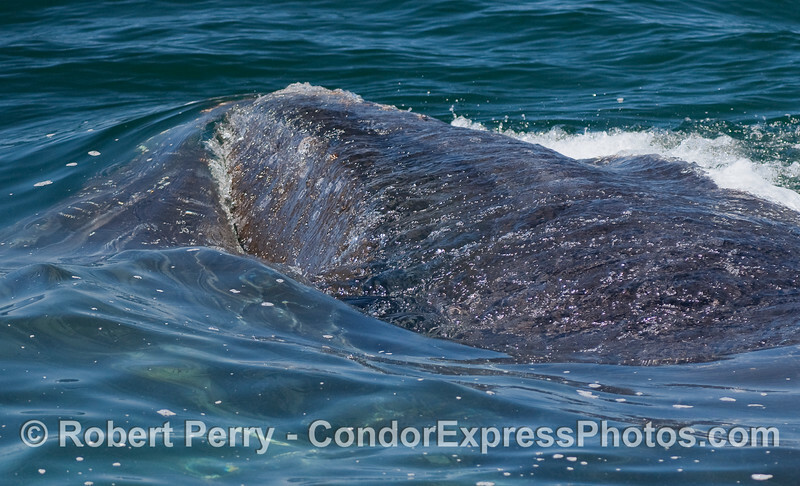 The ventral groove blubber is expanded and the tips of the baleen are stil visible as this whale closes its mouth around water and prey. 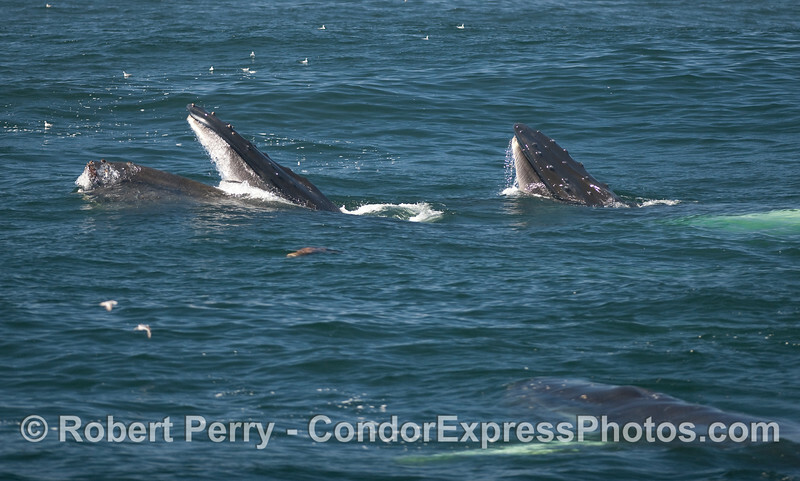 Six Humpback Whale and one feeding vertically with its upper jaw out of the water. 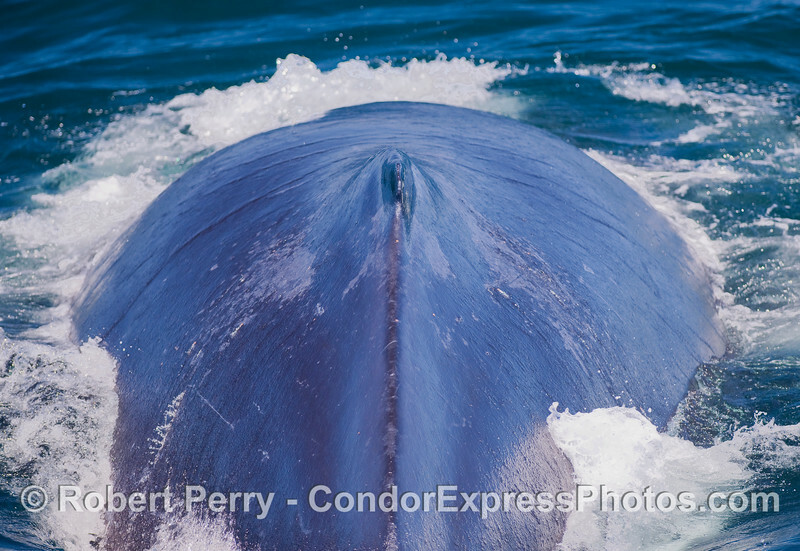 The dorsal fin, or "hump," of a Humpback Whale is seen very close up. 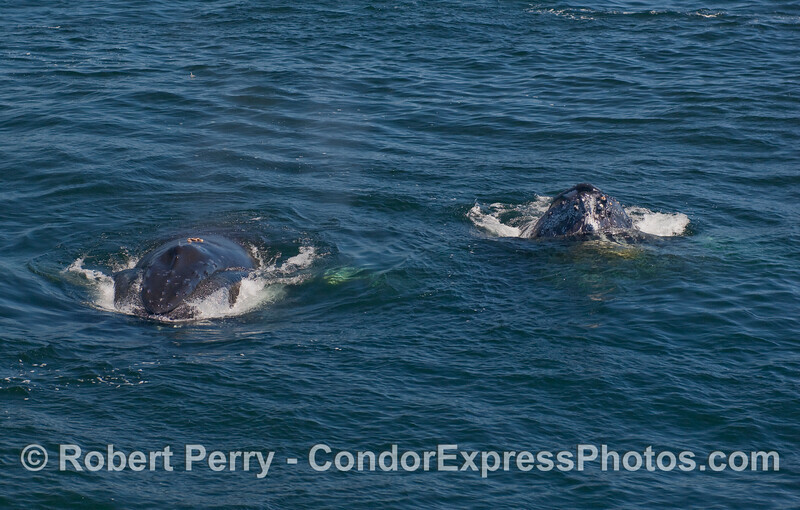 Two feeding Humpback Whale, side by side, heading from left to right. 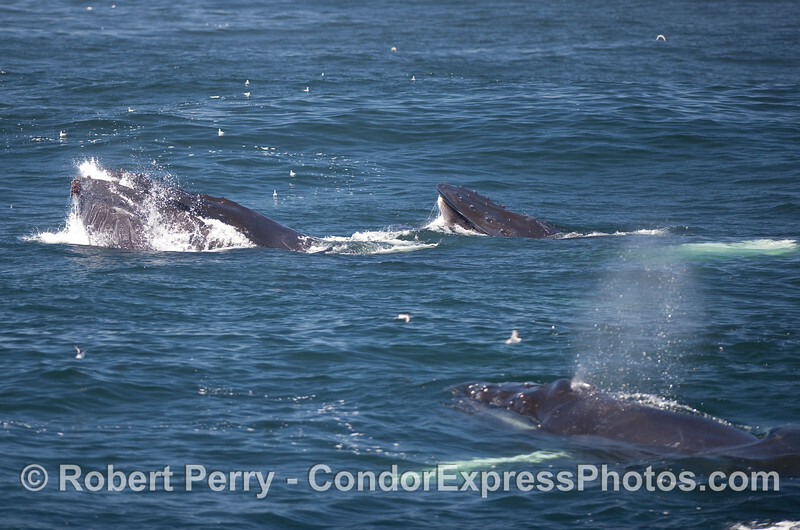 The upper whale is ejecting water through its baleen, while the bottom whale has its mouth open and the upper jaw is out of the water exposing its baleen. 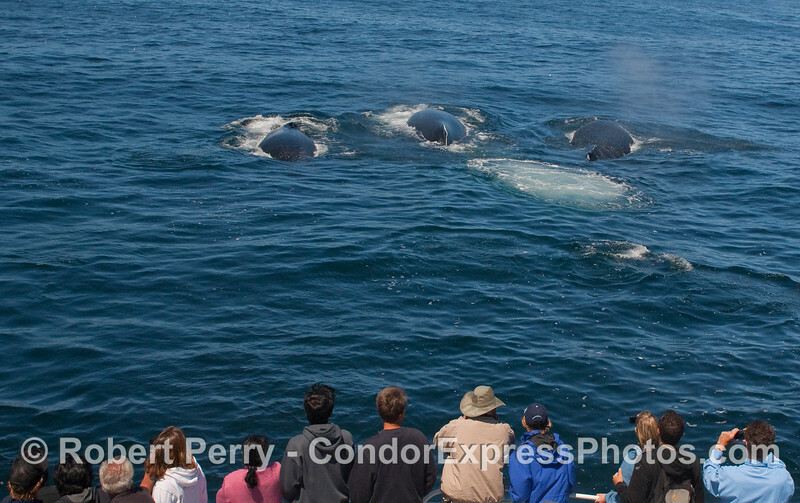 Masses of surface lunge feeding Humpback Whales. It was not a great day to be a krill. Two up, one underwater...feeding Humpback Whales. 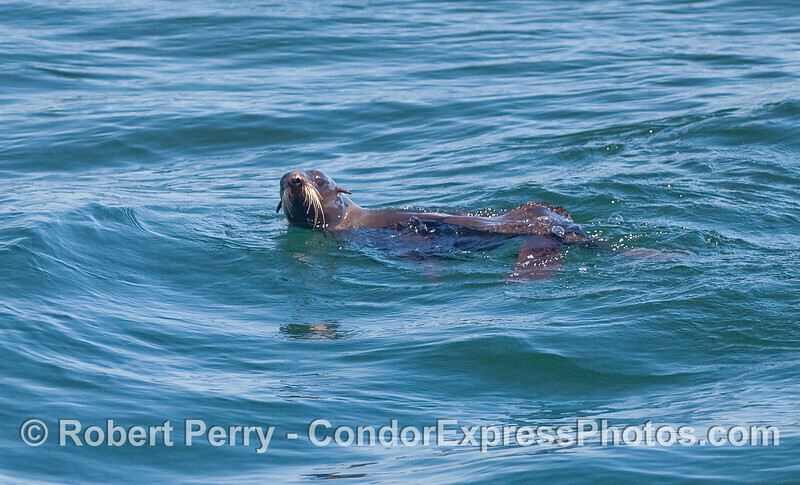 The tan body of a California Sea Lion (Zalophus californianus) is seen, and the numerous birds in the picture are Red Necked Phalaropes (Phalaropus lobatus). Image 1 of 2. 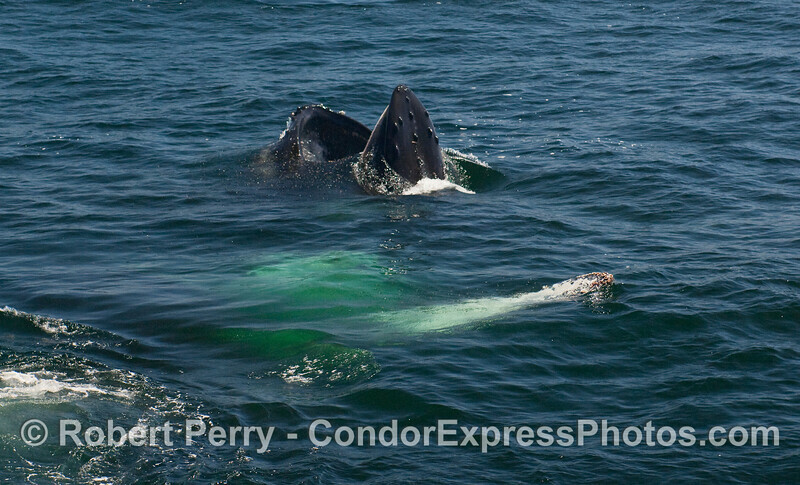 Two up, one underwater...feeding Humpback Whales. Image 2 of 2. 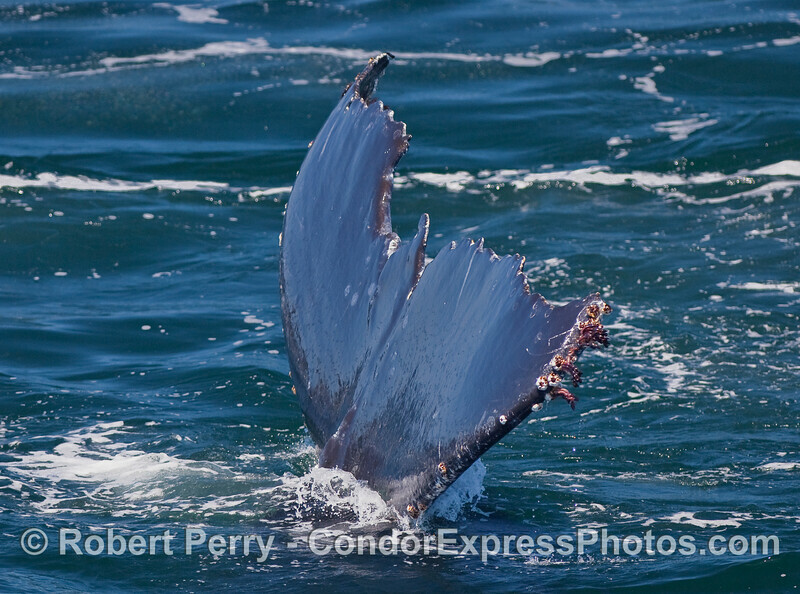 Sideways and a bit upside down, a surface lunge feeding Humpback Whale shows its baleen. 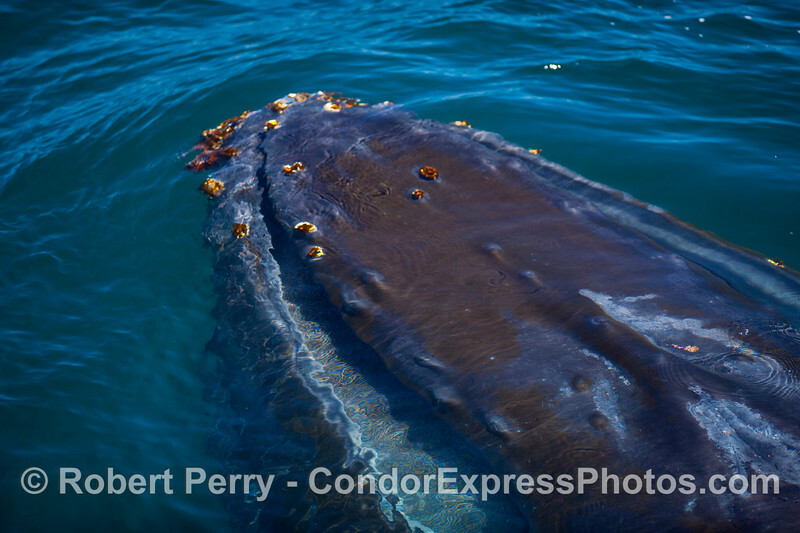 Very very close up look at a feeding Humpback Whale. We are viewing the top of the head/rostrum The mouth is closed with some water being ejected (especially on the right side). Under the water we can see the expanded gullar pouch full of water and krill. The top of the animal appears mottled as water streams off the back. 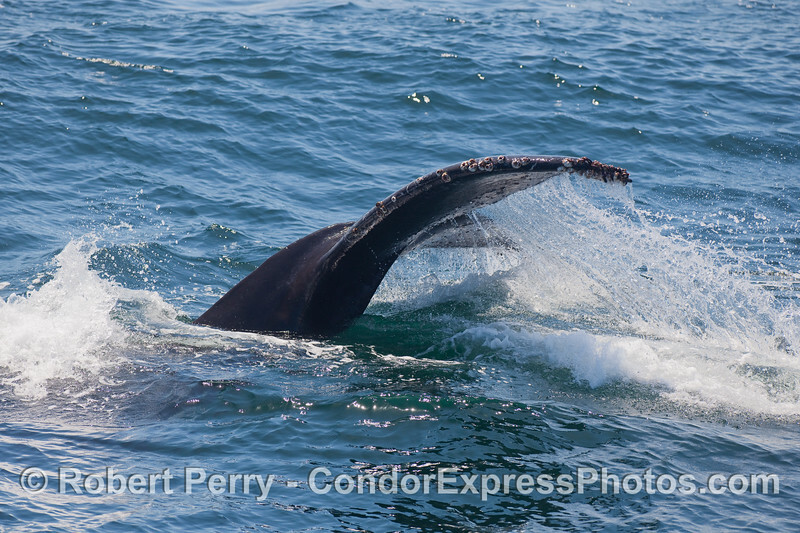 Water pours out of through the baleen as this feeding Humpback Whale completes a vertical lunge. 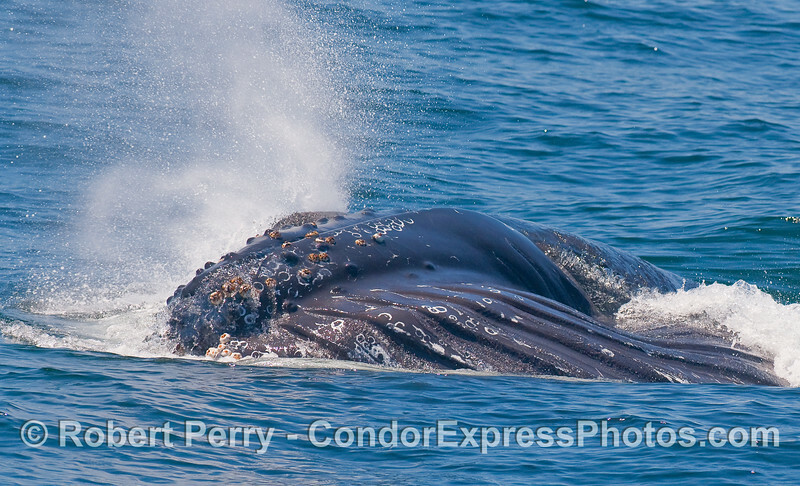 Water pours out of through the baleen as this feeding Humpback Whale sends out a big spout spray from its twin blow holes. 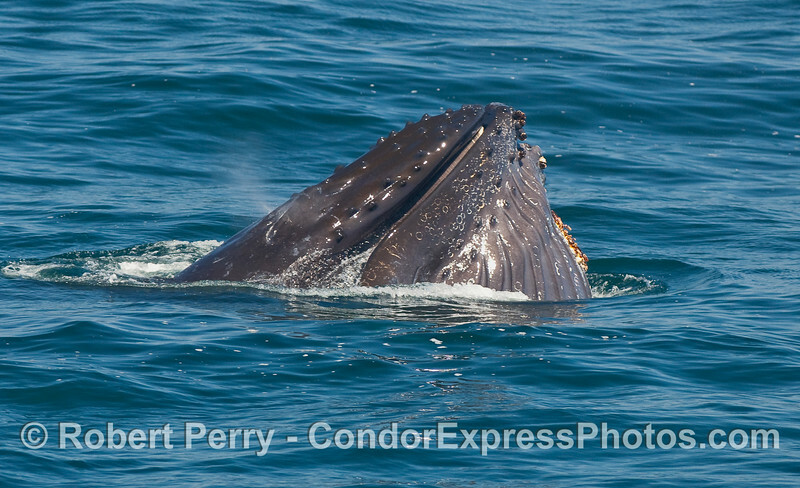 Water pours out of through the baleen as this feeding Humpback Whale completes a vertical lunge. The left eyeball can be seen. 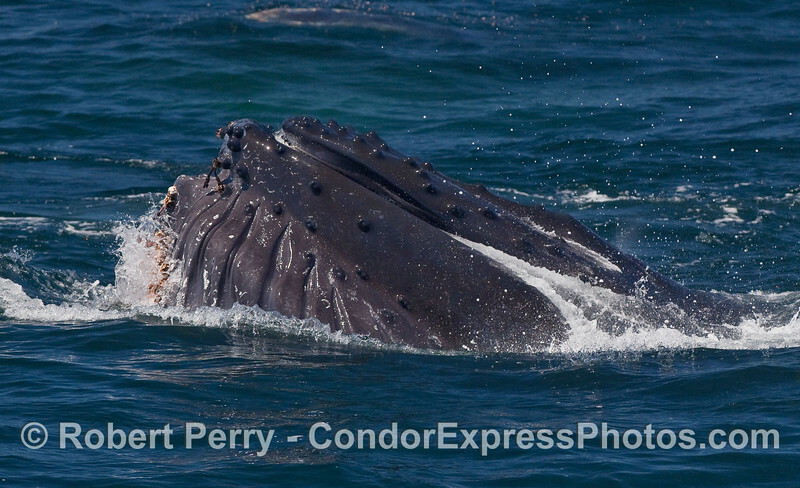 The ventral pouch with blubber grooves is seen as this lunge feeding Humpback Whale shows us the under side of its body. 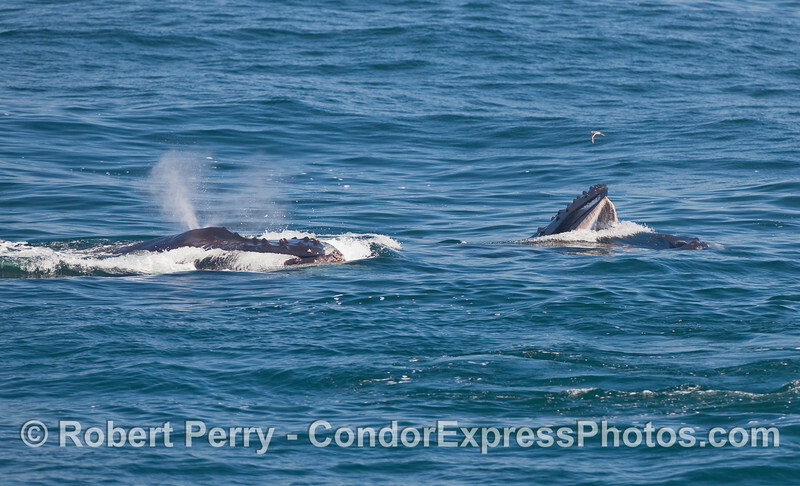 A lunge feeding Humpback Whale with Red Necked Phalaropes (Phalaropus lobatus) flying all around. These tiny birds also feed on krill. 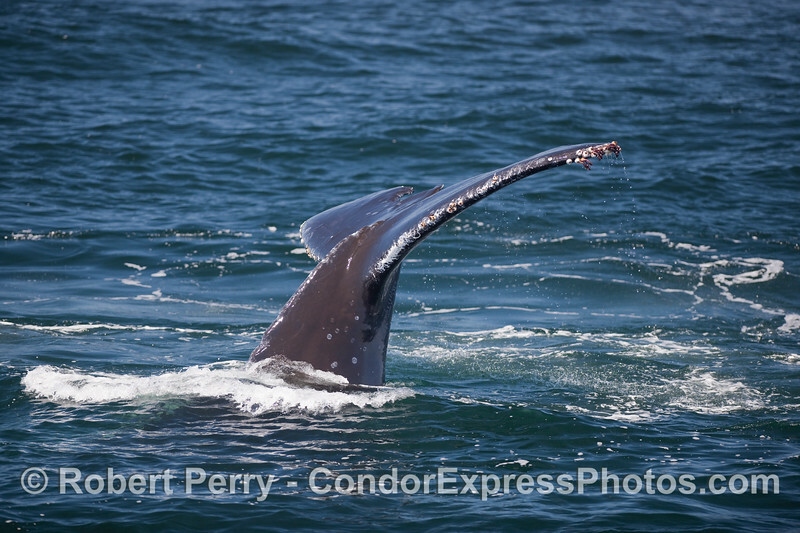 A Humpback Whale is shown laying on its left side with the tip of its tail fluke and right pectoral fin up in the air. 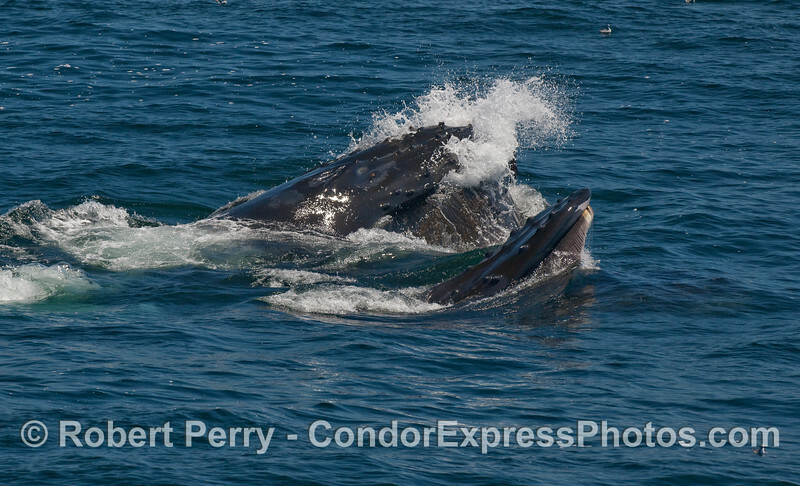 This is the first of two images of this Humpback slapping its long pectoral fin on the water. 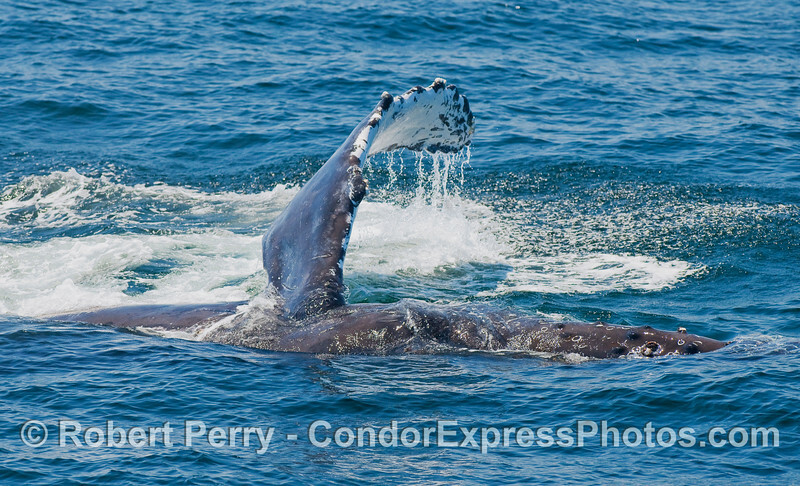 This is the second of two images of a Humpback slapping its long pectoral fin on the water. 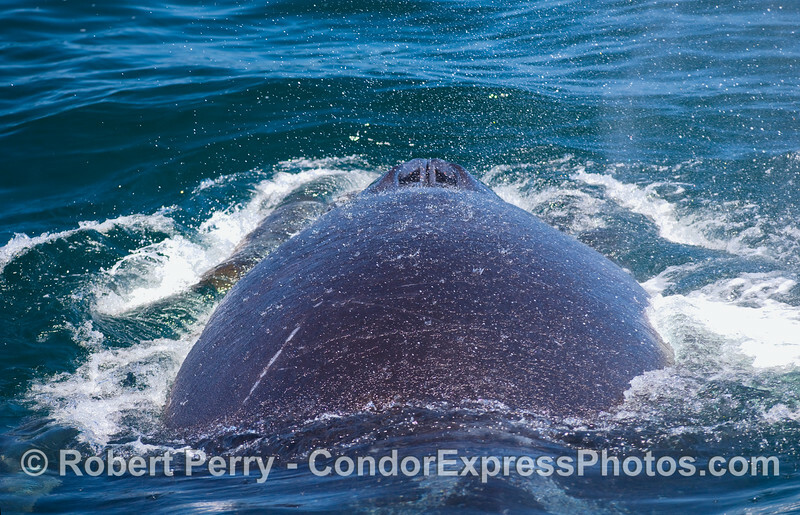 The beast is on its right side, the head is on the right, and the left pectoral fin is causing a big comotion. 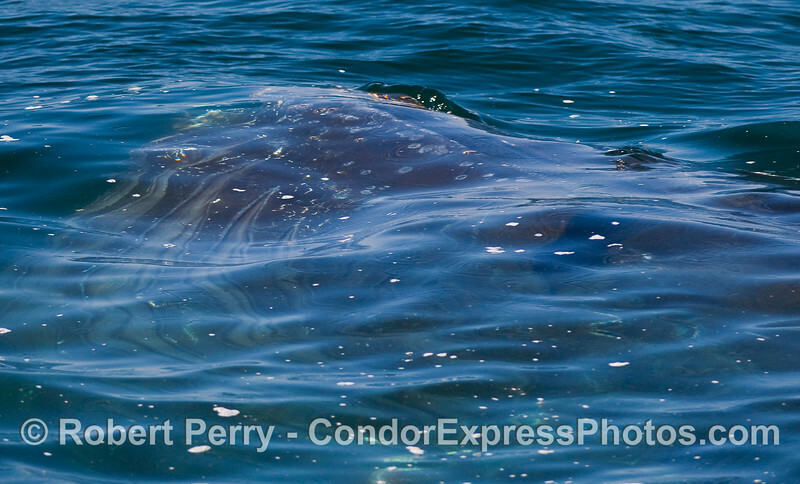 An underwater look at a lunge feeding Humpback Whale that has its ventral pouch fully expanded. The enormous mouth of a Humpback Whale is closing around several hundred gallons of krill-rich seawater. An extreme close up view of the tip of a Humpback Whale's rostrum. 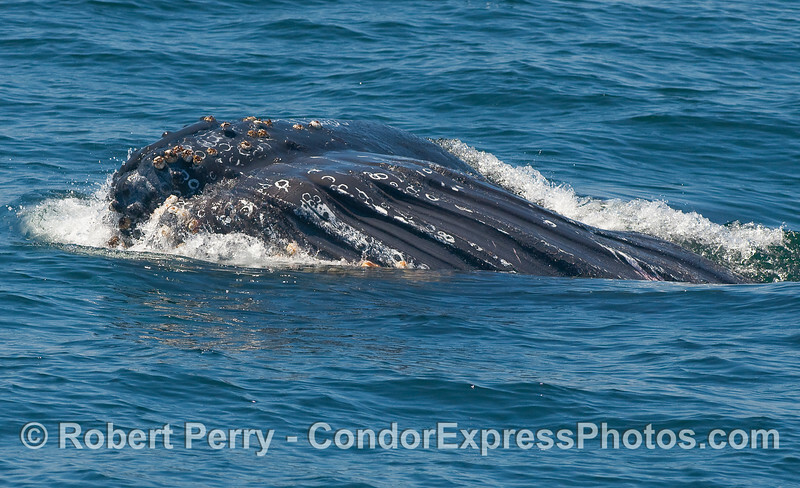 We are looking directly down on the whale's knobby and barnacle encrusted head. 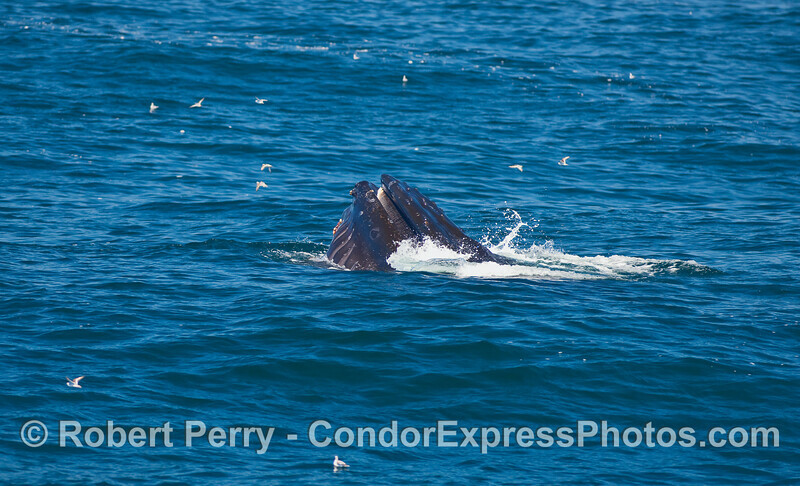 Humpback Whale tail flukes, well chewed. 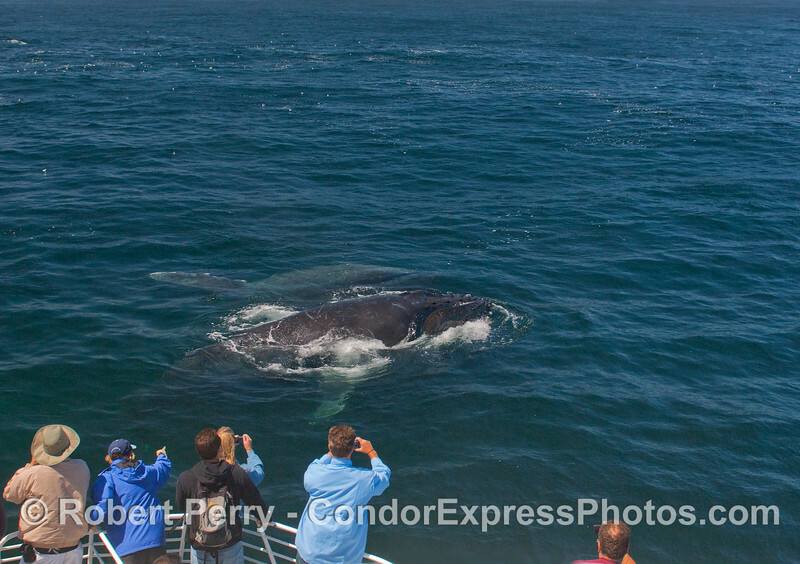 Whalers on board the Condor Express get a great look at a vertically lunge feeding Humpback Whale.